WELCOME TO A BEARY GOOD TIME! * The Ripken Experience is only 3 miles from the cabin! * The ISLAND is 3 miles from the cabin! * Woodland themed tree up all year! * King Size Beds in all bedrooms! * THIS IS NOT A PARTY CABIN. WE DO NOT RENT TO COLLEGE STUDENTS!! 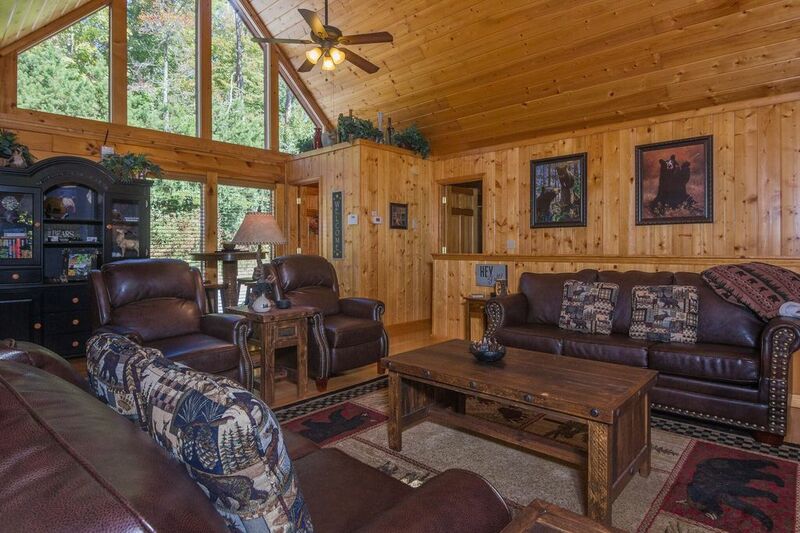 A BEARY GOOD TIME is a perfect family vacation cabin that offers an upscale décor with a gorgeous wooded view. This beautiful 4 bedroom, 3.5 bath log cabin is located in the Hidden Springs Resort and offers all the amenities you are looking for. You’ll be conveniently located off the same road to the Dollywood/Splash Country entrance, which is less than 1.3 miles away, and only 20 minutes from the Great Smoky Mountain National Park. Provided in the large great room is a comfortable sofa and love seat, two comfortable reclining easy chairs and a 60 inch HD TV with Blu-ray player. The sofa is a queen size sleeper sofa. The kitchen is fully equipped with appliances to cook great meals and has a spacious adjoining dining area. We also have a small pub table off the kitchen in the breakfast nook area. The inviting master bedroom has a king size bed, jetted Jacuzzi tub, 32 inch high definition HD TV and adjoining full bathroom. On the main floor rear deck, you can enjoy the beautiful wooded view AND hear the peaceful sound of the resort waterfall. Have your meal or morning favorite drink in the porch rockers or deck table and chairs while enjoying the beautiful wooded view. There is outdoor security cameras in the front parking area. On the lower level game room you will find plenty of entertainment to pass the hours away. You can enjoy many games of pool on the 7 foot pool table or score goals on the air hockey table. Play up to 60 games on the NEW Arcade game system and watch your favorite satellite channels or Blu-ray movie on the 55 inch HD TV. We recently installed a electric fireplace in the downstairs living area for your added enjoyment. A sleeper sofa and two rocker recliners complete this room. Adjoining the game room area are 3 comfortable bedrooms each having a king size bed, bathroom, 32 inch flat panel TV and DVD player. On the outside lower deck, you can enjoy the beautiful wooded view from the country porch rockers or soak in your private hot tub while enjoying the fresh mountain air and listening to the peaceful resort entrance waterfall. We recently added outdoor ceiling fans to enhance your comfort while enjoying the the fresh mountain air. Along with all these great cabin amenities the resort offers a covered heated pool just a short walk down from the cabin. Whether you are looking for the perfect cabin to celebrate a special occasion or a family looking for that ideal vacation destination, this upscale cabin is a preferred choice that will put you close to everything the Smoky Mountain area has to offer. This cabin has a security system to safeguard your belongings. For the Christmas holiday season, A Beary Good Time is decorated with a beautiful Christmas tree in the living area. A BEARY GOOD TIME is ideally located in the Hidden Springs Resort, just 5 minutes down a quaint country road from Dollywood and Pigeon Forge and less than 15 minutes from Gatlinburg along a wonderfully scenic mountain road. Enjoy the quiet and relaxation of a great cabin adventure and yet be within minutes of the best action and adventure to be found in the Great Smoky Mountains! Wooded view around cabin. Mountain views at upper end of resort. We have added a pantry closet for storing of your non-perishable food items. Our family spent a week in Robin and David's cabin. It was our second time vacationing in their cabin. We once again had a great time! The cabin is very clean and comfortable. There are plenty of supplies for everything you need for a great week or weekend. The parking area is one of the only flat parking areas in the entire resort, which is really nice. The kids really enjoyed the hot tub, pool table, and arcade games. The adults appreciated the many places to sit and relax. All in all we had a great time and would highly recommend this cabin. Thank you to Debra as well for doing such a great job in communication and assistance in making the reservation process very easy! Dan, we are thrilled that you and your family returned to visit the cabin! We try our best to make sure our guests are happy guests. You and your family are welcome back at anytime. Thank you for being our valued guests! The cabin is beautiful and has plenty of room for a family getaway. We had 3 generations with us and everyone had something to do. The whole family agreed our vacation there was simply not long enough! The beds were nice and comfy, the towels were extremely soft and fluffy. The cabin was very clean. We had a blast playing the games and enjoying the hot tub. It’s very conveniently located to town. GPS didn’t take us straight to the cabin, just the resort but the owners instructions were easy to follow. We would love to come back another time. Jennifer, thank you so very much for your 5 star review! We are so pleased your family enjoyed the cabin. We are looking forward to having you be our guests again! Very nice and very clean. So roomy! We hope you will visit with us again! We spent a long weekend at ‘A Beary Good Time’ and it was perfect! Exactly as described, clean and neat as promised. What more could you ask for spending a relaxing weekend in the Tennessee Mountains. Most definitely would recommend this to anyone who is looking to just get away. Only a few minutes from Pigeon Forge and all it has to offer. Wonderful! We are so pleased that you enjoyed the cabin. It was our pleasure to have you stay at A Beary Good Time! We would love to have you visit again. Loved the attention to detail in this cabin. Compared to other cabins parking on a flat surface was nice. Felt very homey. Great location; only 10-30 minutes to everything we wanted to do. Average being 15 most often. Loved being able to use the hot tub. They had brochures of things to do in the cabin, salt, pepper, some spices, some coffee, trash bags, small cooler, to go mugs, etc. It was nice that the ice was already made. One minor concern; frying pans were warped so making eggs was difficult as they rolled to the side. Although there was Cooking spray. Super close to Dollywood as you pass the entrance as you go to your cabin. We were so busy that we never used the pool on site. We will be back. Overall, great experience. Thank you very much for your 5 Star review! It is our goal to have our guests enjoy their time at the cabin! We will look at the frying pans and replace as needed. Thank you so much for your 5 star review! We would love to have you back for another visit in the future!